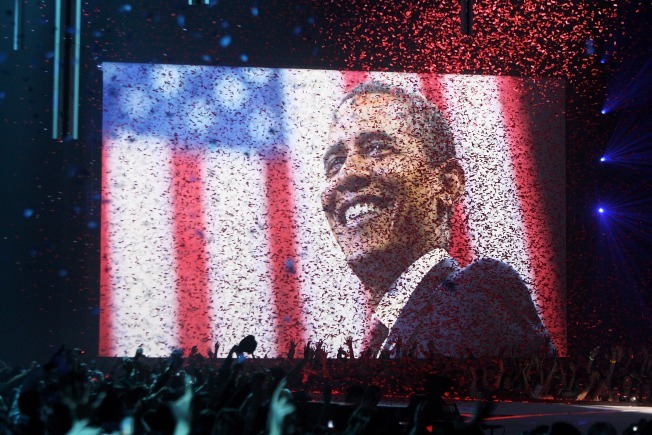 US President elect Barack Obama onscreen at the MTV Europe Music Awards, held at the Echo Arena. President-elect Obama’s inaugural committee is inviting supporters to give as much as $50,000 or raise as much as $300,000 to underwrite the festivities, and is offering incentives that include tough-to-get spots at the swearing-in ceremony. On Wednesday afternoon, top campaign donors – who helped Obama become the $1 billion man this campaign cycle — were e-mailed a schedule showing the perks of supporting the team one more time. The contribution limits were voluntarily imposed by the Presidential Inaugural Committee, which points out that individuals have given as much as $250,000 to past inaugurals. In keeping with the committee’s promised “new standard for openness,” organizers are posting the names of all the fund-raisers – known as “bundlers” – and donors of $200 or more. The committee says it posts the names of donors – along with their cities and occupations – within 48 hours of receiving the contribution. According to the initial disclosure, seven people have raised the maximum of $300,000 each, and about 180 people have given the maximum of $50,000.